Welcoming a new life to the world is an amazing moment for a family and begins a new chapter in your story. The first few weeks of a baby’s life are among the most amazing as they change daily, memories that can easily be lost amongst sleepless nights and all the visitors to your home. Your newborn baby photo shoot, whether you choose to bring your baby at 8-18 days old or to wait until they are 4-6 weeks old, will centre on capturing these subtle changes and details so you can remember their soft hair to their tiny toes long after they have grown up and started their own families. Your newborn baby photoshoot will take place in more homely of the two photography studios. Simple and cosy, the Baby Suite has all you need when it comes to young babies including a full height baby changing table for your comfort and plenty of space to unpack your baby items. Multiple heaters allow me to keep the room super warm for all those naked baby photography poses. Directly outside the room, is a large changing room for your use, and a separate kitchen area for hot/cold drinks and snacks. Parking is directly outside for your convenience. A Chesterfield sofa installed for lifestyle images also provides homely and relaxed seating area, with some new parents even taking a chance to have a snooze! For everyones convenience it’s imperative that newborn photoshoots are reserved prior to the birth of your little one. This allows me to pencil you into my diary and for me to discuss your likes and dislikes as we prepare for your photoshoot. I understand your baby is unlikely to arrive on their due date so I book you a flexible date adjusted once little one arrives. As your chosen newborn baby photographer I want to style your baby’s photoshoot to suit your personal style and home decor using the wide selection of high quality props, backgrounds, blankets and newborn ‘fashion’ accessories that I have. 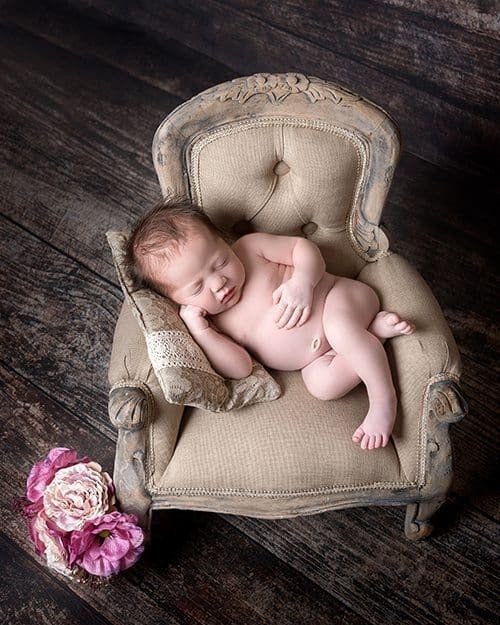 The Enchanted Photography studio is desgined to be a calm, peaceful environment, equally respectful of a new baby as well fragile, sleep deprived parents. Soft lighting, relaxing music and a comfy sofa makes a perfect scene for natural lifestyle photos of your family as well as somewhere for you to rest. 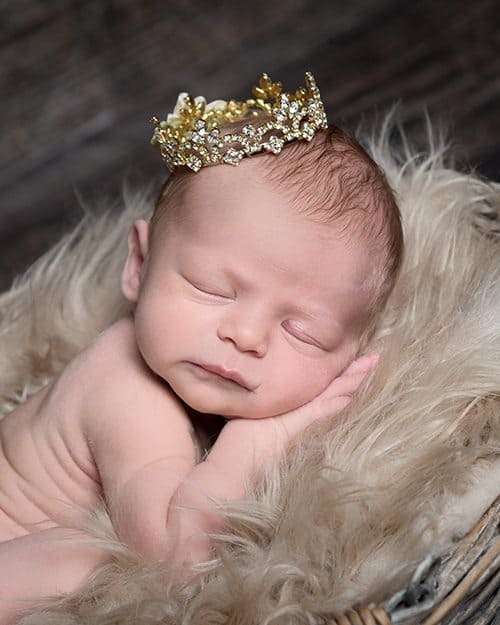 A large number of high quality baby props and accessories are available to personalise the session including soft mohair, wool and knitted hats, diamonte and petite flower headbands, baby bow ties and crowns, as well as a wide selection of furs, wooden bowls and buckets, crates, antique chairs and more. Throughout your baby’s newborn photo shoot you will have access to the kitchen facilities at the studio to enjoy unlimited tea, coffee and biscuits. Just one week later, we will meet again at the photography studio; be prepared for your heart to expand just that little bit more as you see your precious newborn baby looking so serene during their first photoshoot. Your baby will have changed even further in the short time between their photoshoot and your photo viewing session so these are already precious memories of a time that has passed. My complimentary image retouching service includes removing untimely blemishes and making the colour of the images really pop to enhance your photos. We can go through each image together, finding the right photos to display in your home, and those you wish to have digitally, to truly capture the immense love you feel for your newborn baby. To book a newborn baby photoshoot there is a booking fee relevant to your preferred session type as detailed in the grids below. Photos taken with parents and/or siblings using studio sofa, bed and walls. One hour photo viewing session where you can choose your favourites. Three to four prop setups while baby is asleep for example asleep on a bed, on the edge of a bucket or bowl. Wanted some pictures done of my little girl while she was tiny to remember her by. I absolutely love the photos Gemma produced. A newborn baby can sometimes have more bags than the rest of the family, but within the studio you will feel at home with room to unpack and relax with a full height baby changing table for quick fixes and outfit changes. A separately kitchen area/foyer provides additional space for siblings to stretch out and a place to help yourselves to hot/cold drinks and snacks. These are photos you want to treasure forever. The fabrics, props and backgrounds for your photoshoot are chosen for the comfort of your baby and to create a natural and pure feel to these memories. The smallest details from extending fingers out from their clenched little fists to posing each and every toe ensure you can appreciate the perfection of your precious baby. With more than 8 years of experience and many hundreds of photoshoots I understand that all sessions must remain baby led. Newborn babies are so tiny and fragile they deserve the respect to be treated with the utmost care when posing their dainty fingers and toes. Trained to a high standard in baby safety, I use a multitude of baby soothing techniques to maintain your baby’s comfort throughout their newborn photoshoot.